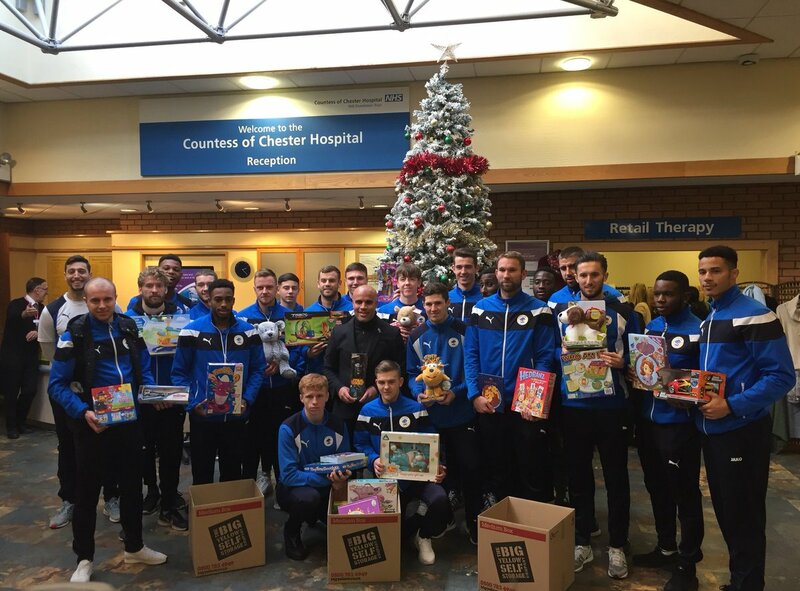 Chester FC players and staff today visited the Countess of Chester Hospital to deliver presents to the Children’s Ward in time for Christmas. The presents come courtesy of donations to the Blues from our fantastic fans, set up by Big Yellow Self Storage. It is the third year CFC have been involved with the Big Yellow Christmas Toy Appeal and – together with the Community Trust – a bigger and better success every year. Jeff Banks of Big Yellow Self Storage said: “We’ve been able to take many of the donations to the Children’s Ward at the Countess of Chester Hospital. Every single player – along with Manager Marcus Bignot and CEO Mark Maguire – attended. Then, staff along with Lucas Dawson, James Jones, Ryan Astles, James Akintunde and Jordan Archer went across to the Ward to see some of the young children and present them with their own toys. CFC Community Trust Chief Executive Jim Green also attended, and he added: “It is never nice to see young children in hospital but it’s particularly difficult at Christmas. Overall, with still many more donations to come in to Big Yellow Self Storage, £5,000 worth of new toys & gifts has been raised – with the Blues playing a significant part in this. Thanks to all Blues fans who donated presents and made a difference this Christmas! RAFFLE | Chester FC Christmas Raffle 2018! BACKING THE BLUES | New community ticket initiative launched!